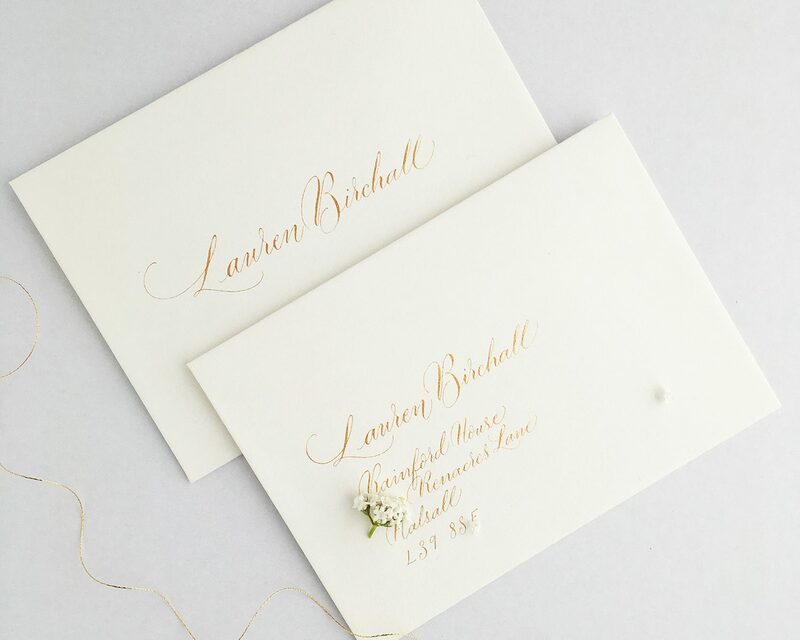 Lovely Lauren asked me about gold calligraphy addressed envelopes for her wedding, and these are the samples I addressed for her this week. 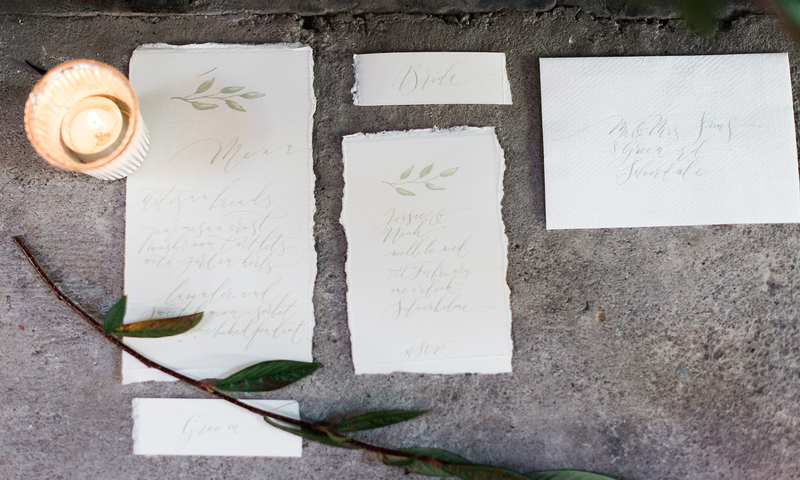 Some envelopes are more suitable for calligraphy than others. 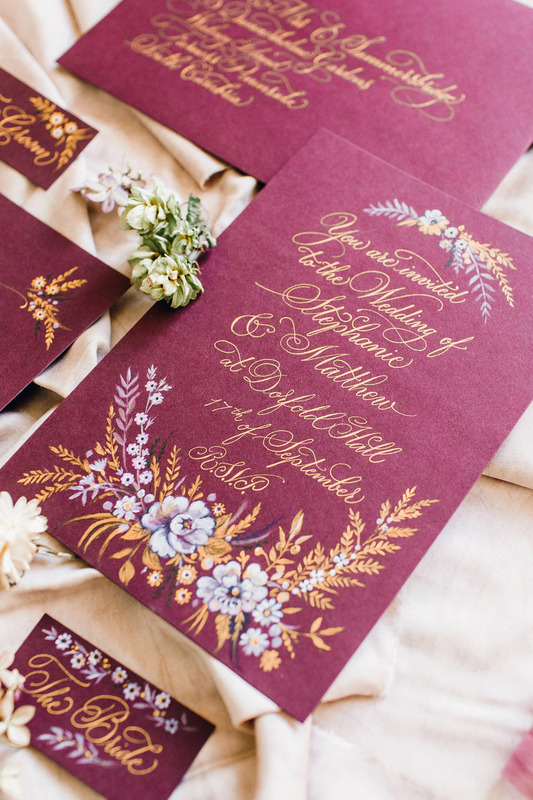 These are absolutely perfect – they’re a GF Smith paper stock, and work wonderfully with the gold ink. 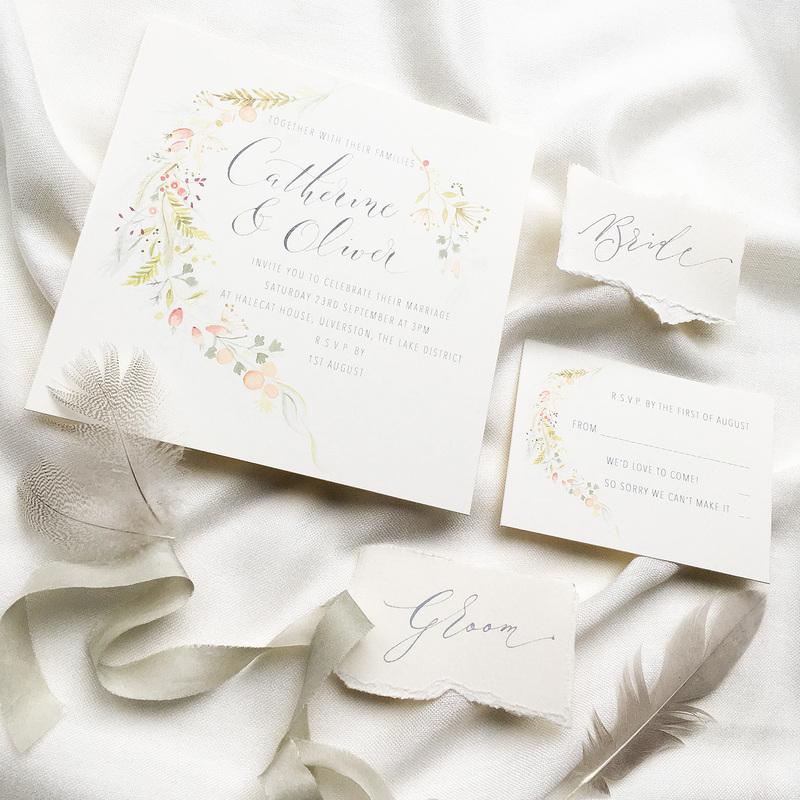 Thank you to lovely Ellie from Silk Beau for the samples to test. 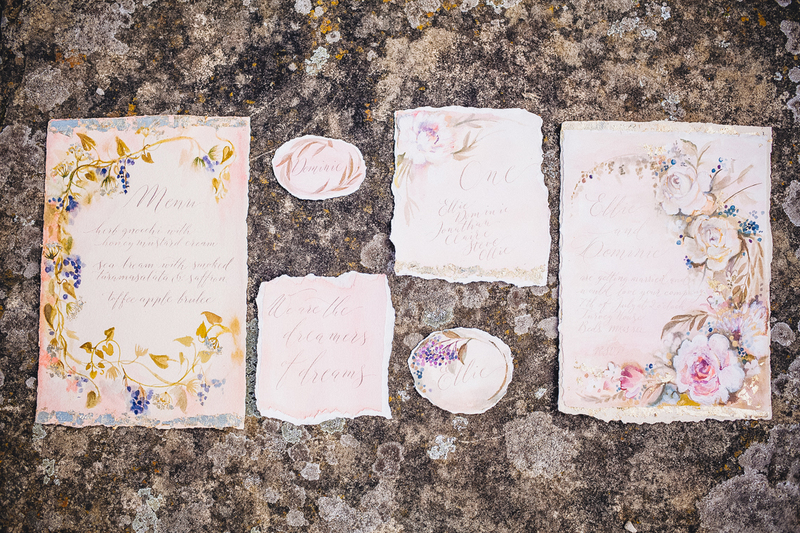 I do so hope to be addressing more of these for Lauren soon! 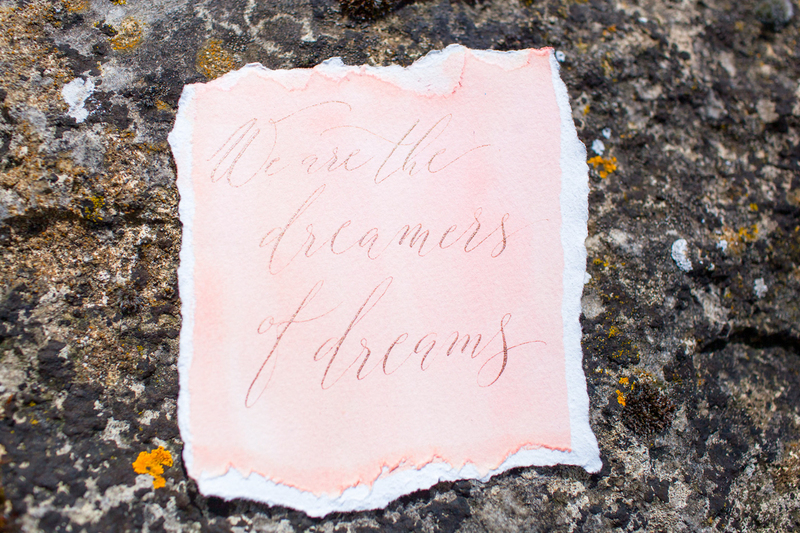 Hand calligraphy and bespoke commissions make up around a third of what I do. 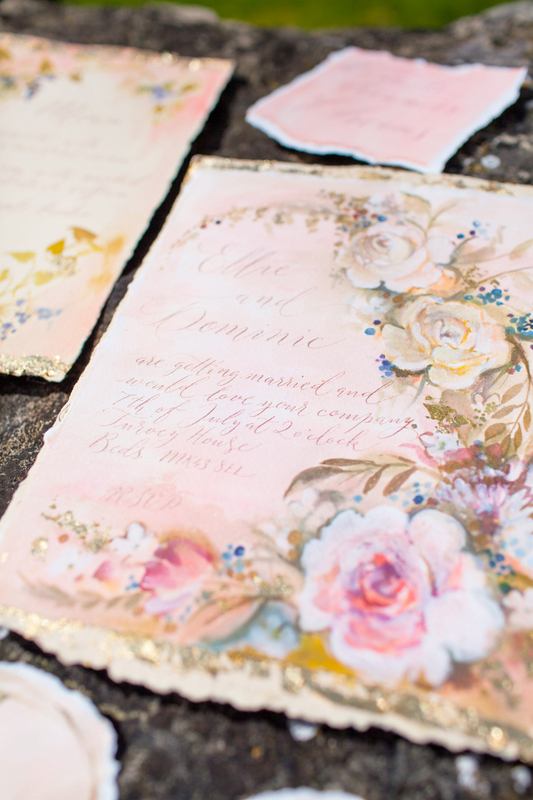 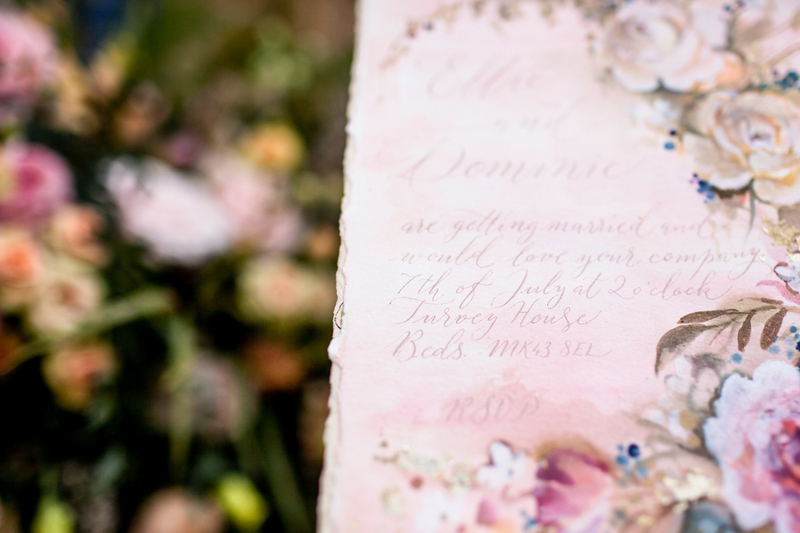 Bespoke wedding invitations are wonderful to work on, and writing on handmade and watercolour papers is a dream. 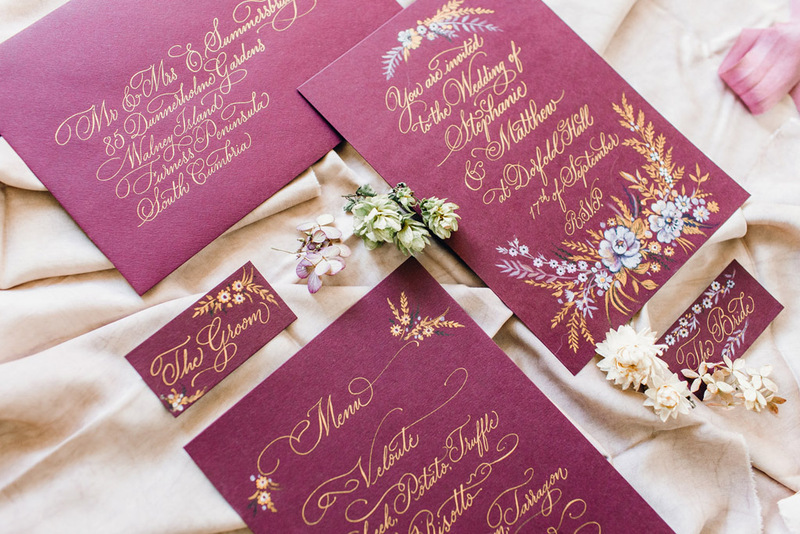 But these projects can be expensive, and I want calligraphy to be available to every bride and groom. 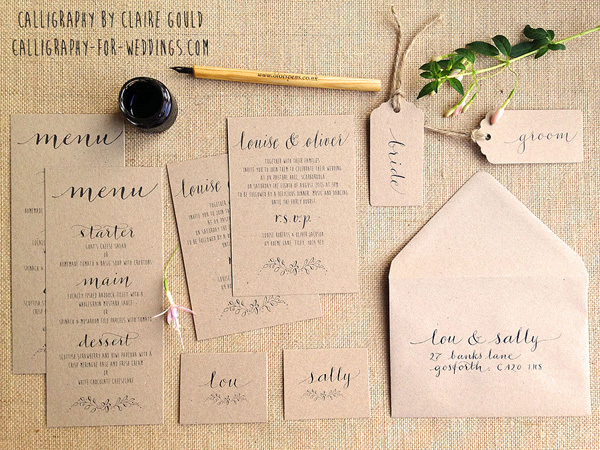 With this in mind I have developed a range of affordable calligraphy wedding invitations for By Moon & Tide. 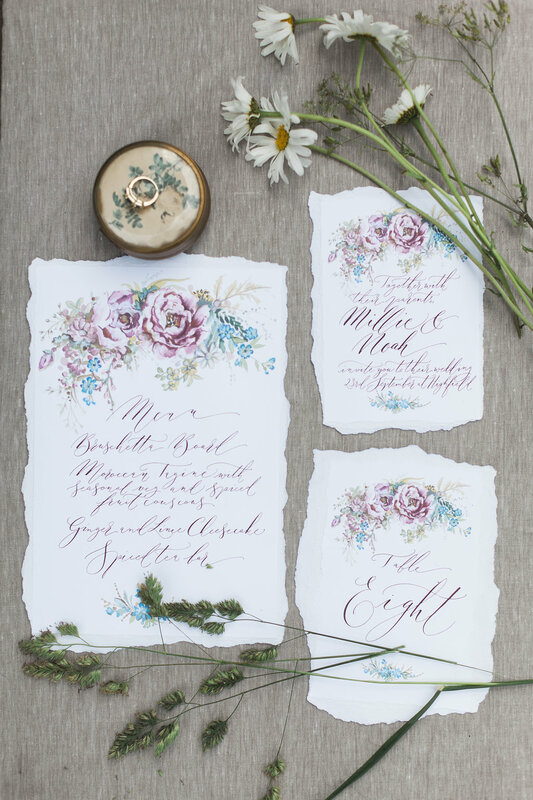 They’re timeless and on-trend, with minimalist design, beautiful typography and watercolour illustrations. 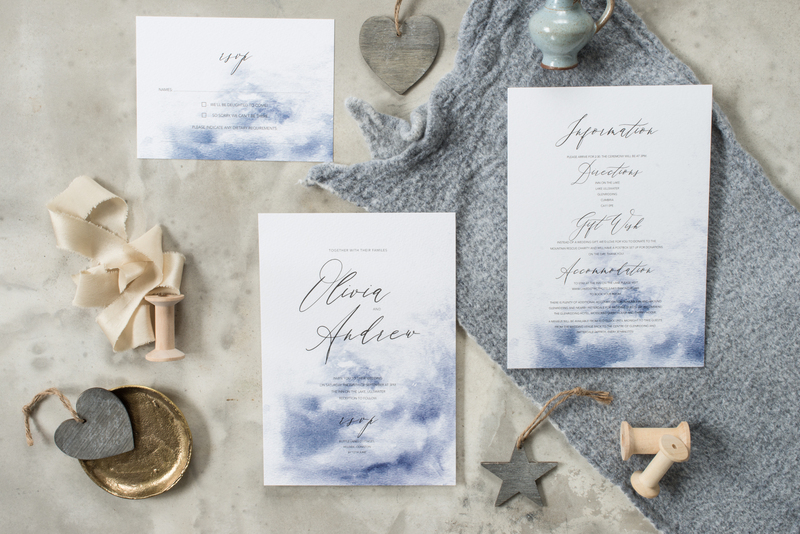 The 2018 invitation collection has something for every bride and groom, from botanicals to watercolour effects, soft dove greys to stormy midnight blues. 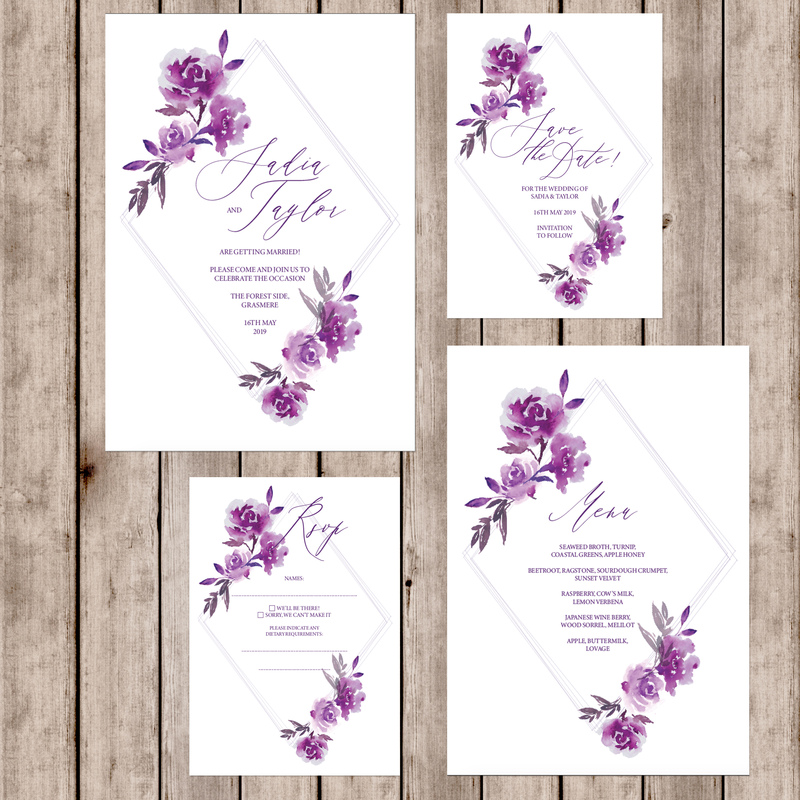 Prices start at £1.65 per invitation, with samples available for just £1.50. 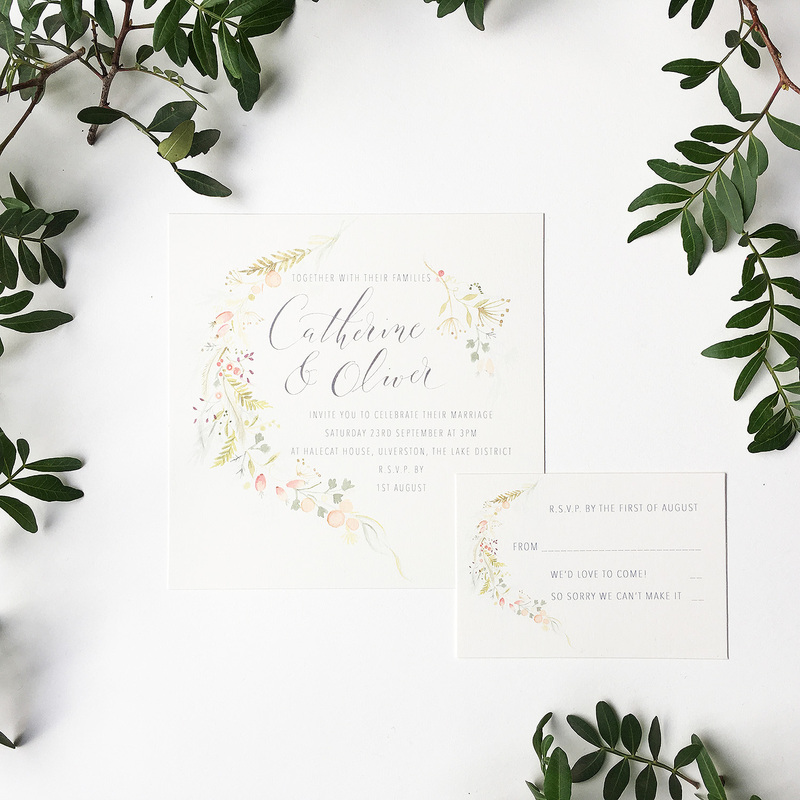 Each design in the collection has an invitation, rsvp cards and information card, and is easy to personalise for your wedding. 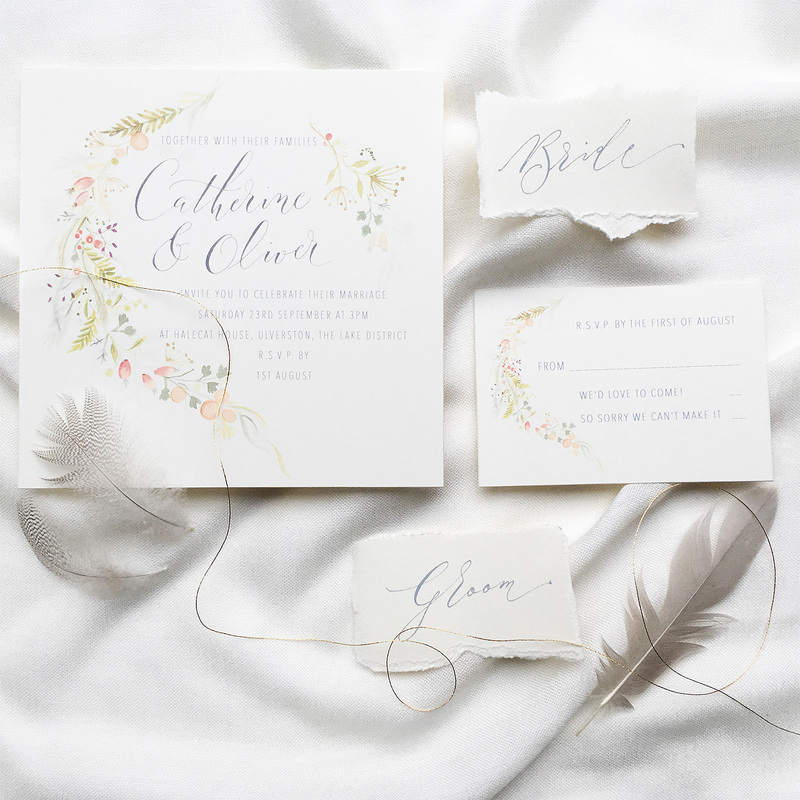 Each design has been carefully crafted with illustrative elements and calligraphy fonts to give you the calligraphy ‘look’ without the price tag of bespoke or handwritten pieces. 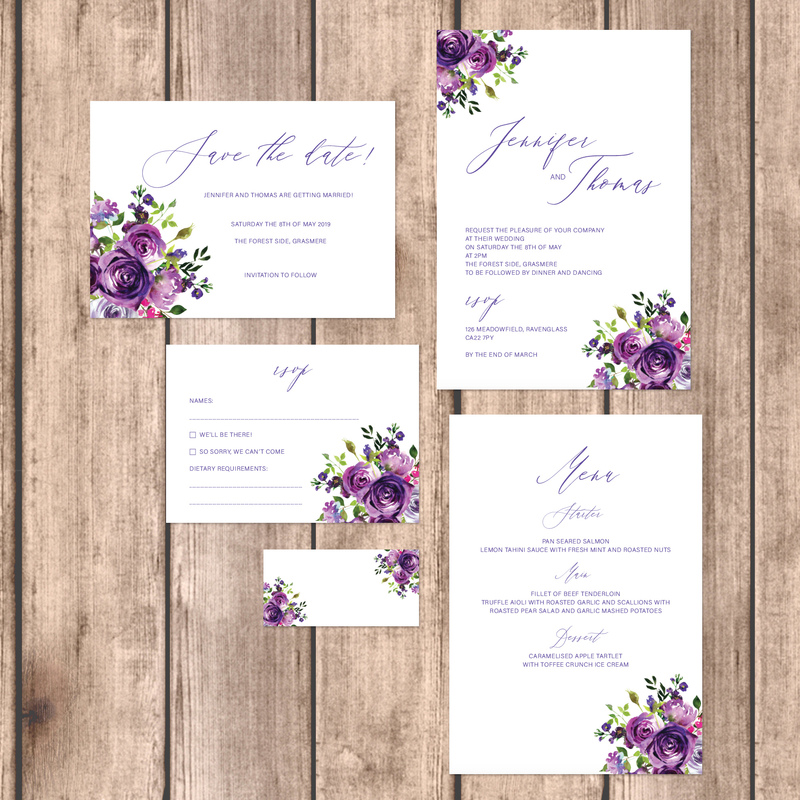 While I’m still writing bespoke invitations for smaller weddings, these wedding invitations are perfect for larger celebrations and couples on a tighter budget for wedding stationery. 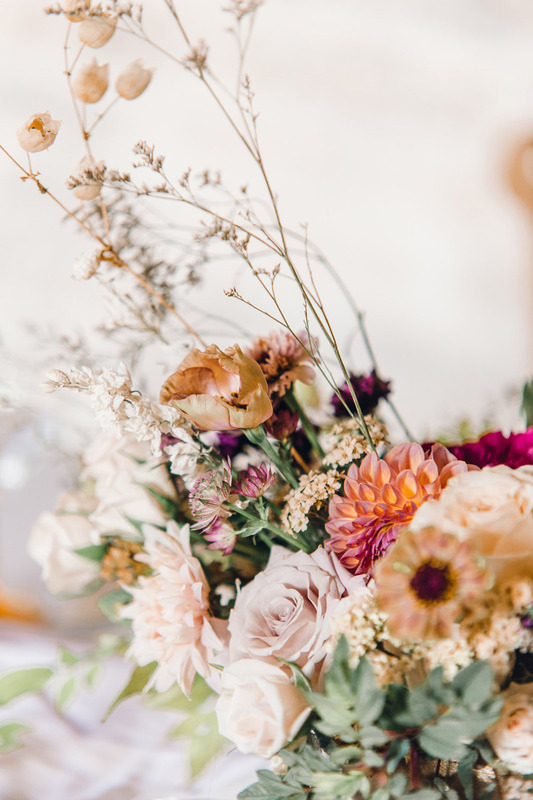 The internet is far from perfect. 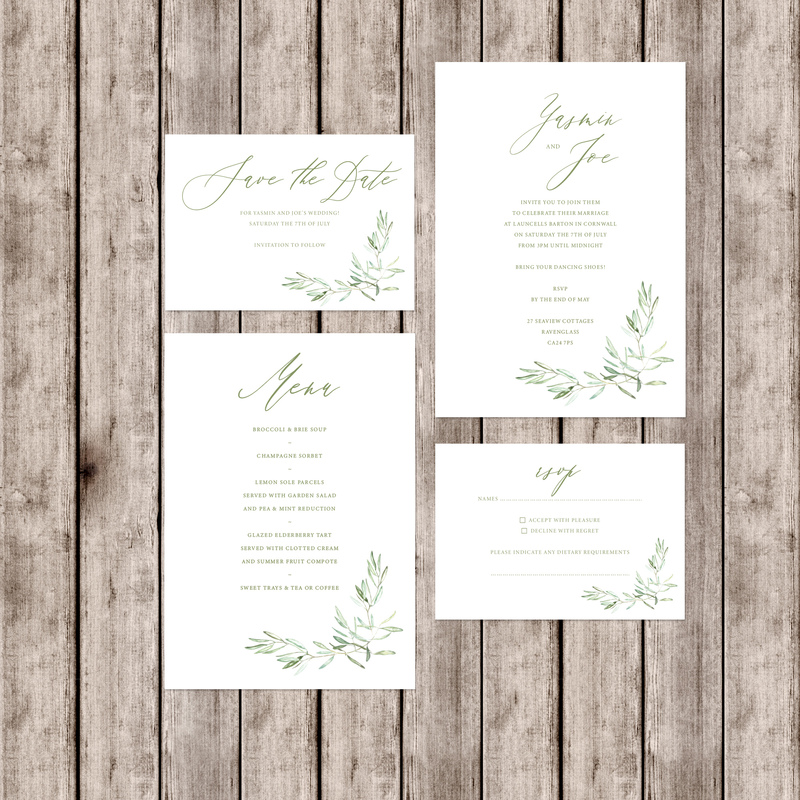 Google for inspiration for wedding invitation wordings and you’ll find advice from 2007 alongside recommendations from 2017. 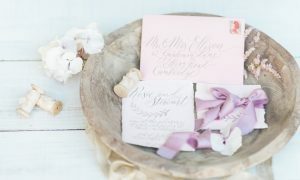 And when you read some of those old fashioned wordings you could be forgiven for thinking that’s how everyone’s writing their invites. 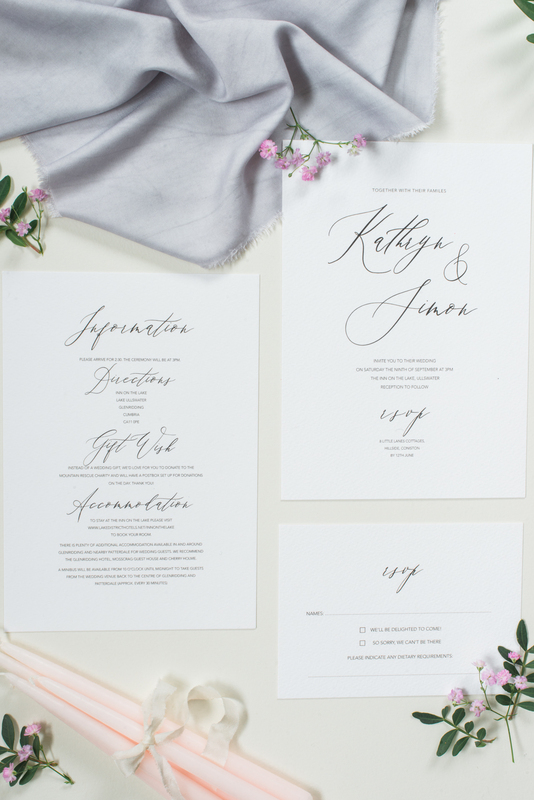 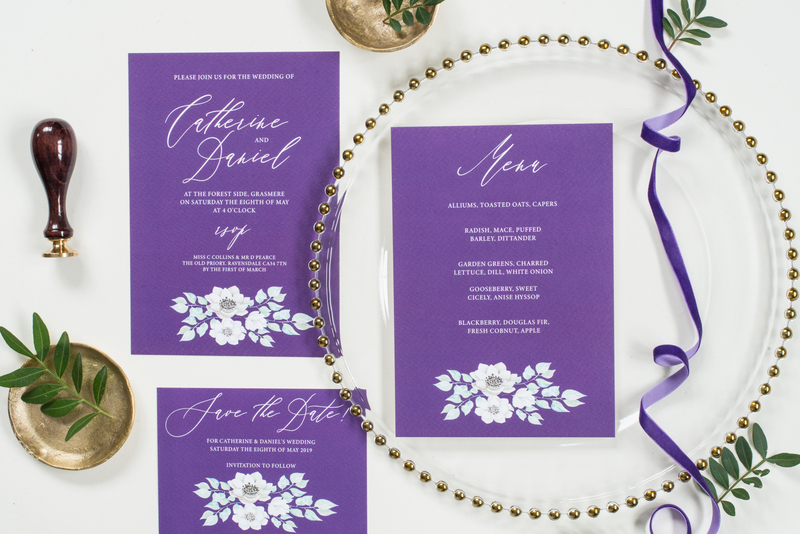 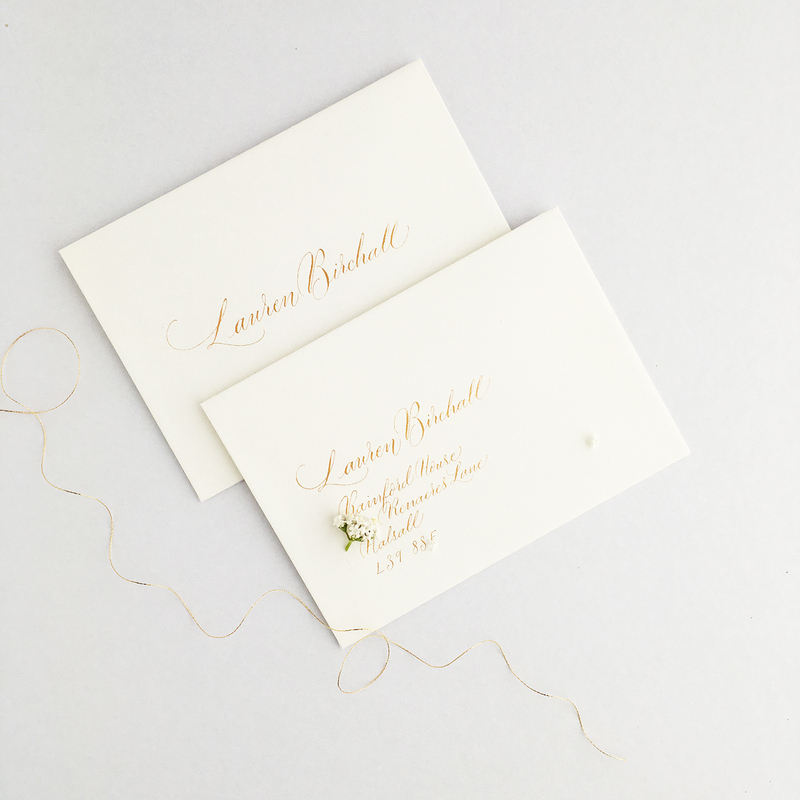 Just as wedding dress styles have changed in the last decade, so have invitations. 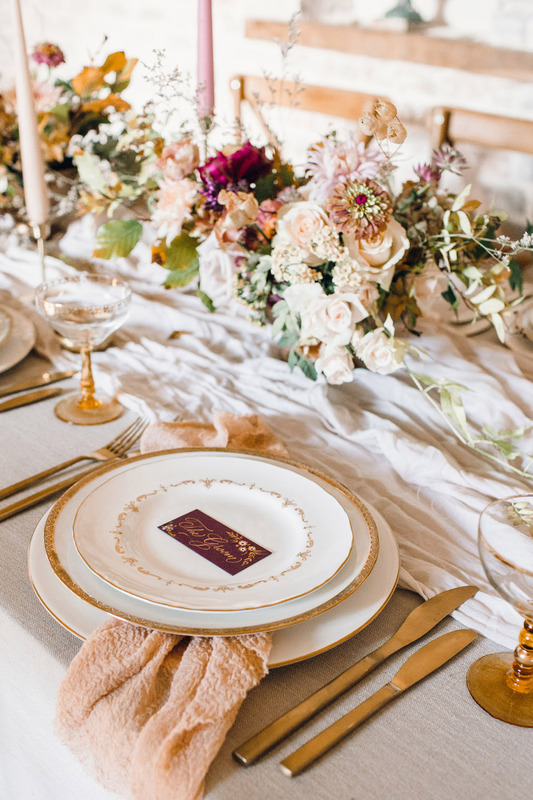 “Mr & Mrs Smith request the pleasure of your company for the marriage of their daughter…” is falling by the wayside along with stretchy white chair covers and mason jars. 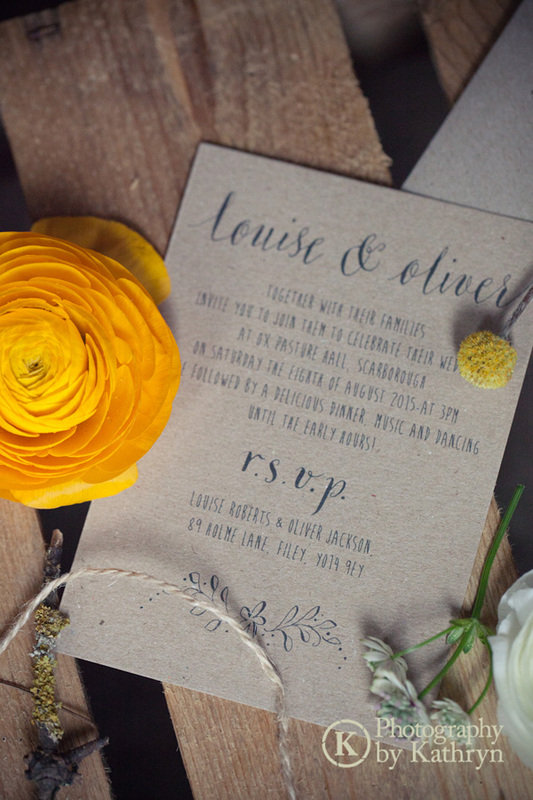 Modern brides and grooms are choosing their own wordings, and sending invites which sound brilliantly personal, friendly and real. 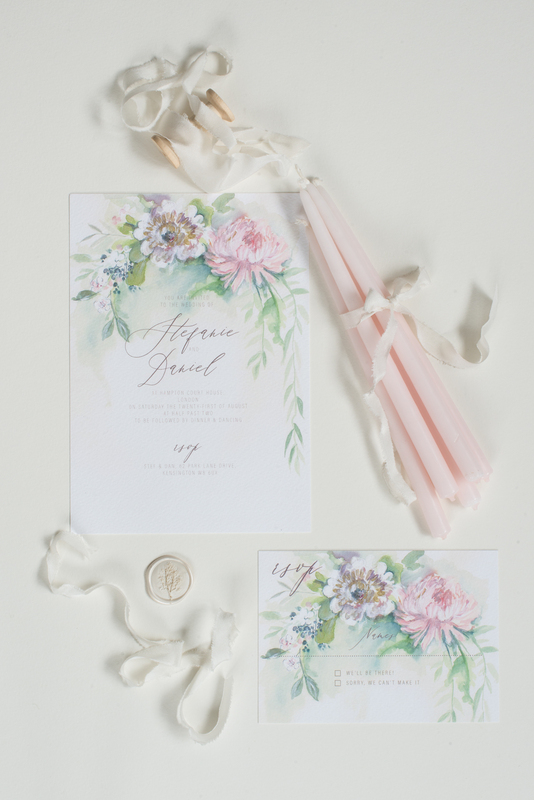 Image credit Jenny Heyworth Photography for Aspire. 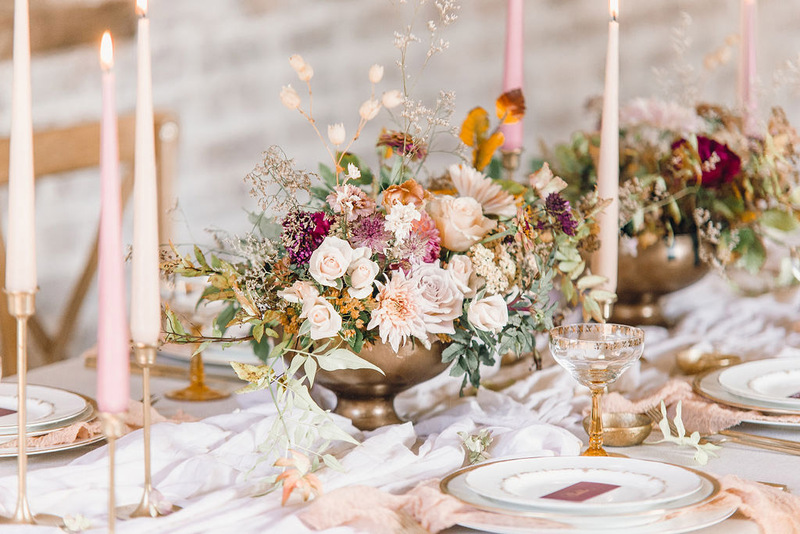 Styling by White Feather & Co. 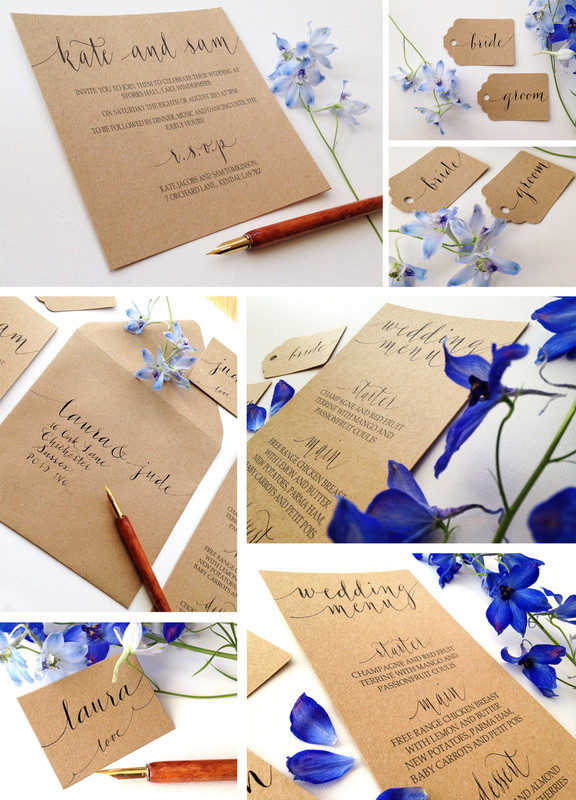 So forget about writing to your friends to request the pleasure of their company and send invites which are more you. 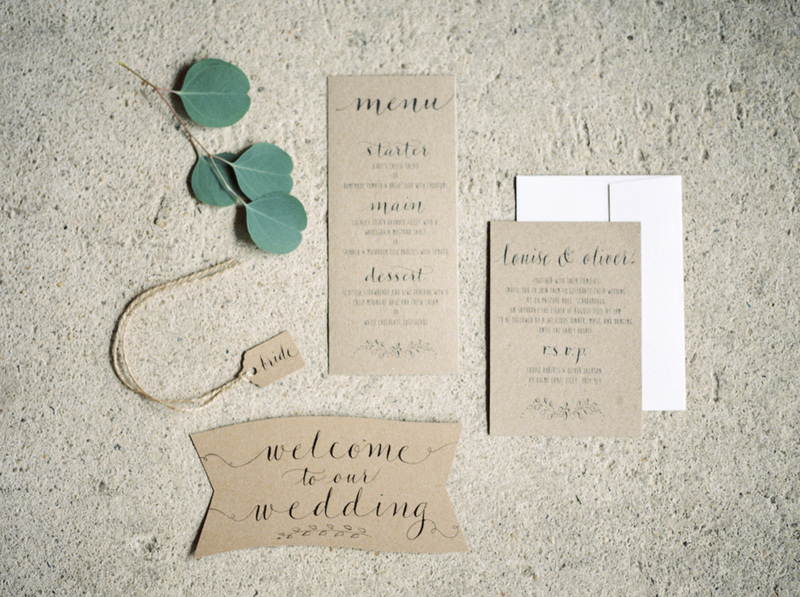 Short & sweet is definitely the way forward for wedding invitation wordings. 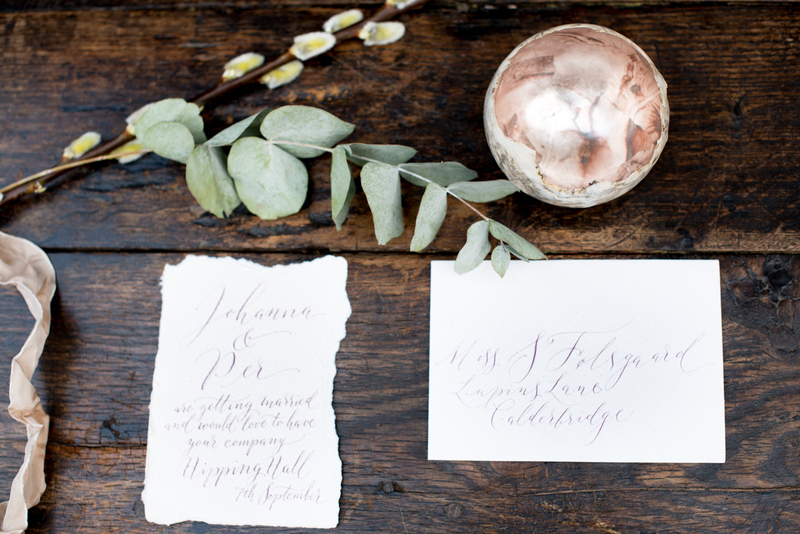 If you’re considering handwritten calligraphy invites, then a shorter wording will make them really affordable too! 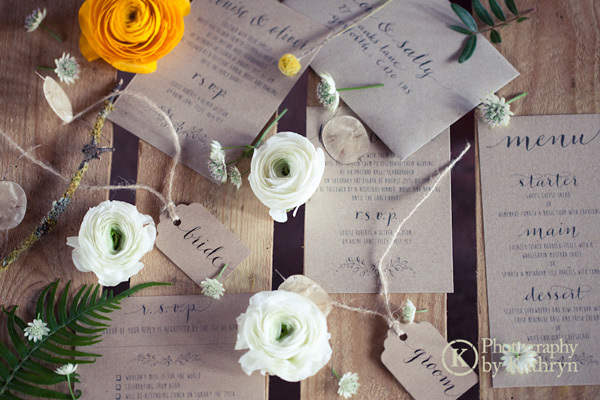 Simple, friendly wordings alleviate any pressure to mention your hosts by name – an especially thorny issue if your parents have remarried. 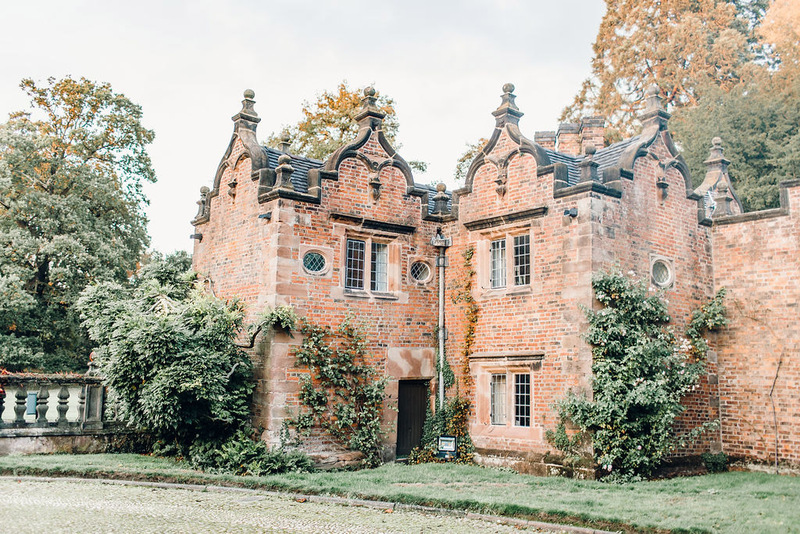 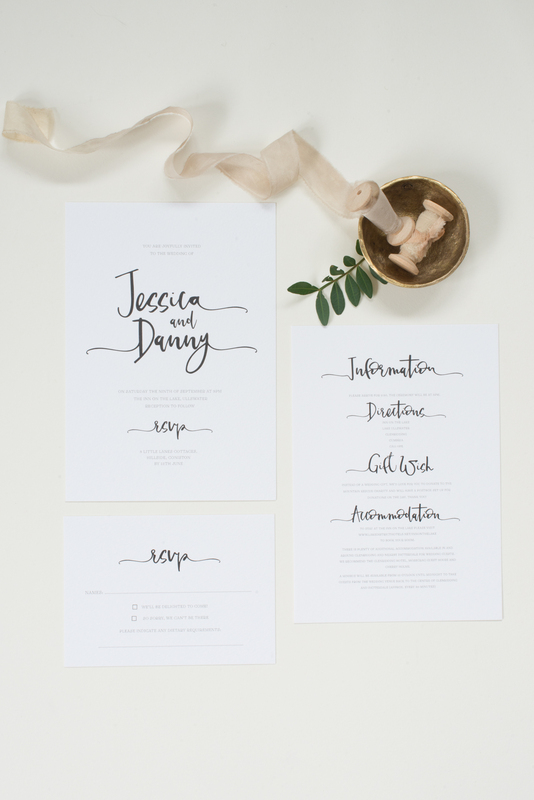 Keeping your printed wordings simple doesn’t mean you’re giving guests less information – all you need is a wedding website where you can share as much information as you like – from RSVPing online to accommodation lists, timings, taxi companies and even the story of how you met. 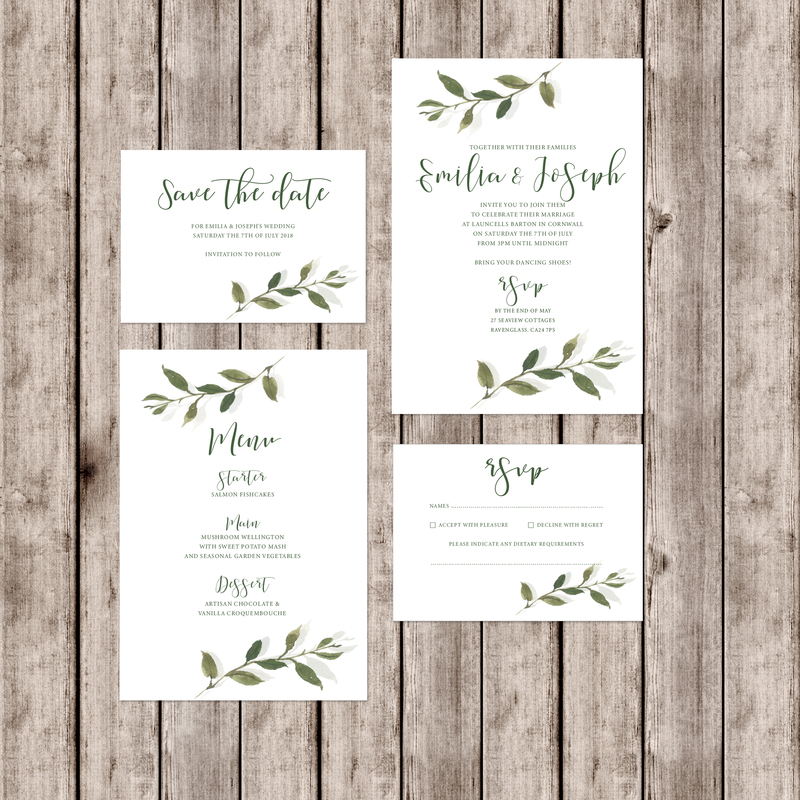 I just love that wedding invites in 2018 are heading for simple design-led styles. 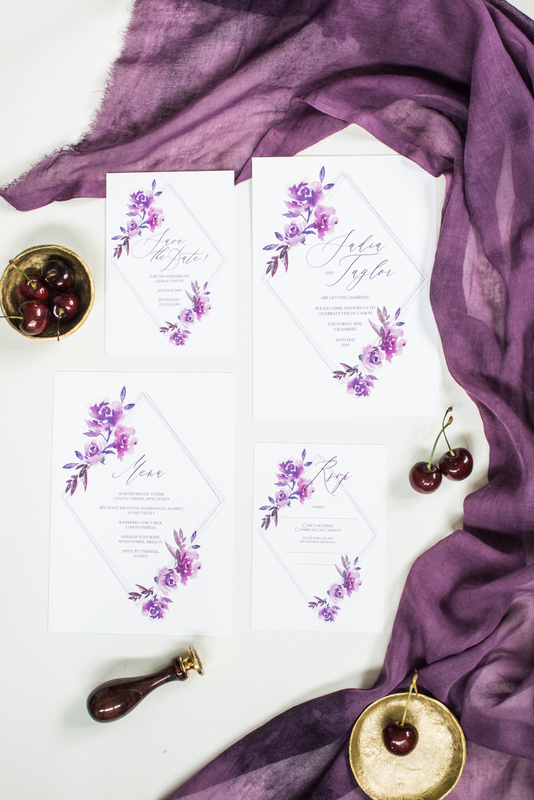 And by pairing your printed invites with a simple website you can share ten times the information you’d ever have seen in a pocketfold invitation back in 2007! 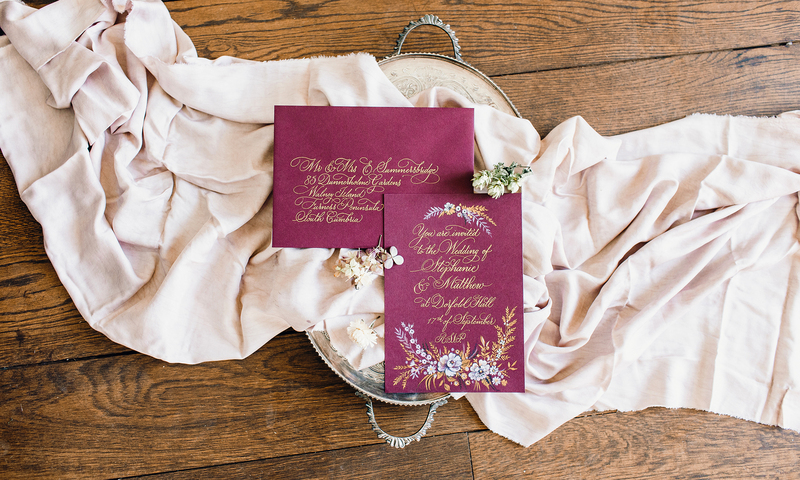 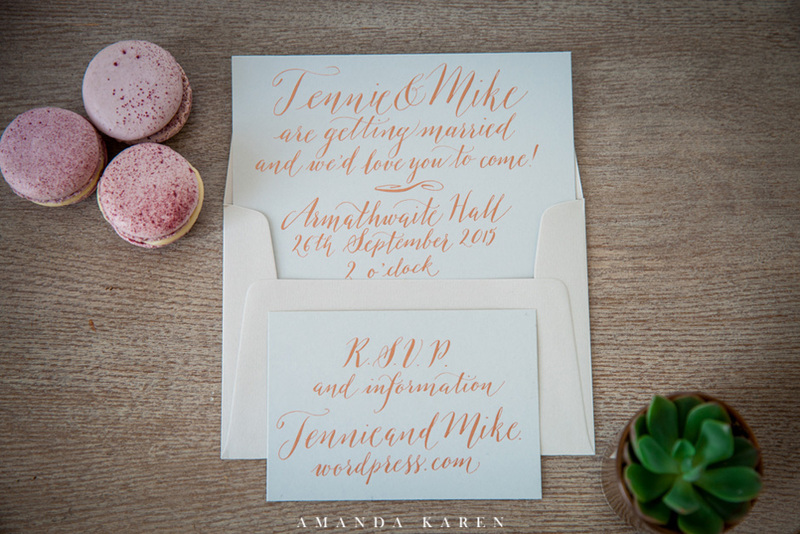 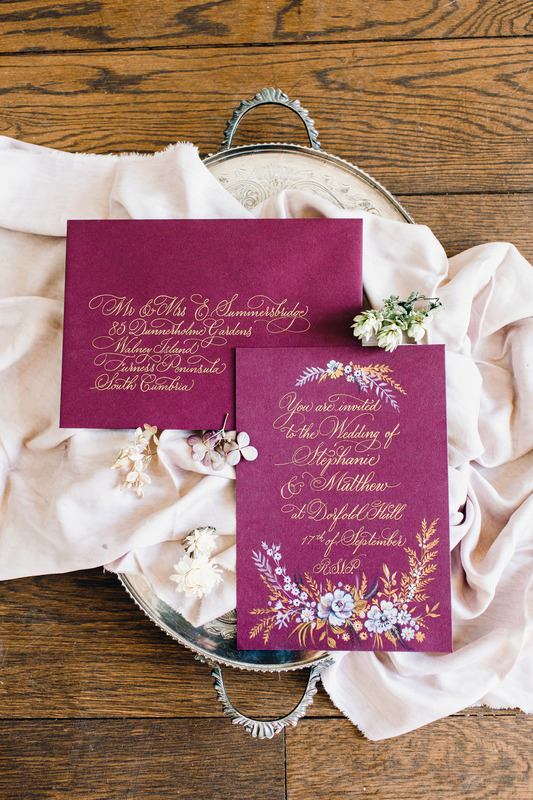 It’s always so exciting to see my calligraphy on a major wedding blog, and last week was the turn of one of my favourites – lovely BLOVED blogger Catharine featured a bespoke illustrated invitation with hand lettering in a rose gold inspiration feature. 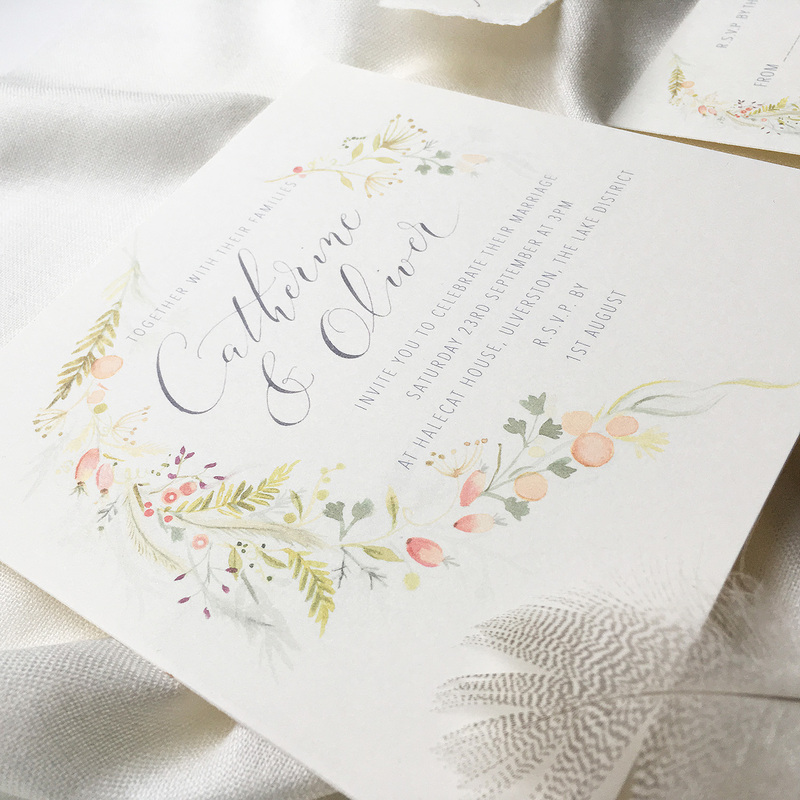 This richly illustrated invite suite has such a pretty aesthetic for a summer wedding, with illustrated florals by my wonderful friend Amy Swann. 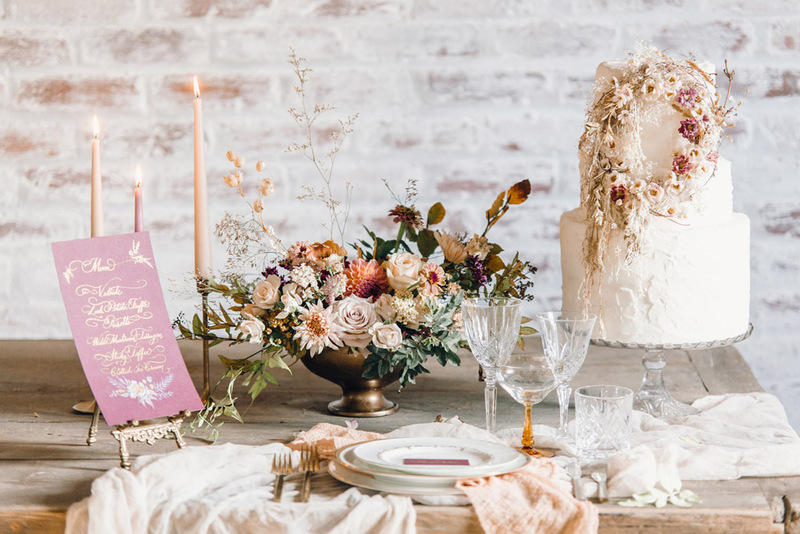 Protea and tumbling foliage create depth and texture in the design – in this case we added a touch of rose gold leaf from Hanover for extra sparkle and shine! 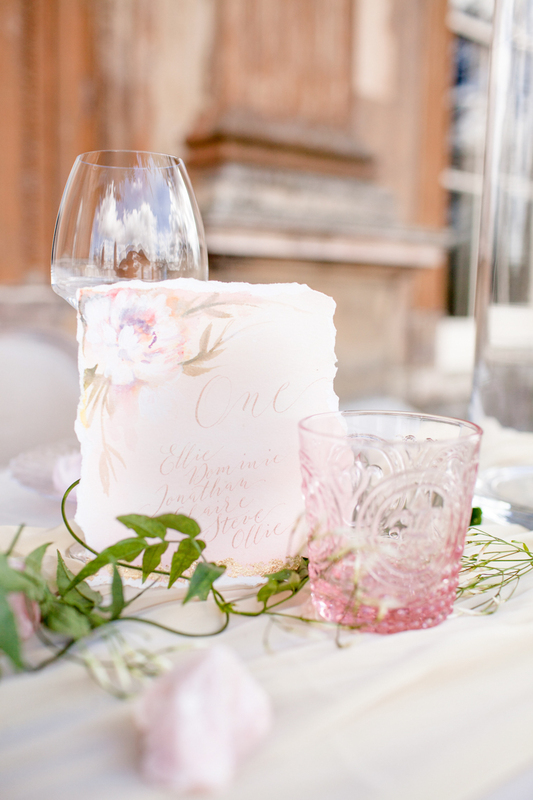 The lettering was handwritten in Finetec rose gold ink – with everything from place names and menus lettered by hand in the same colour. 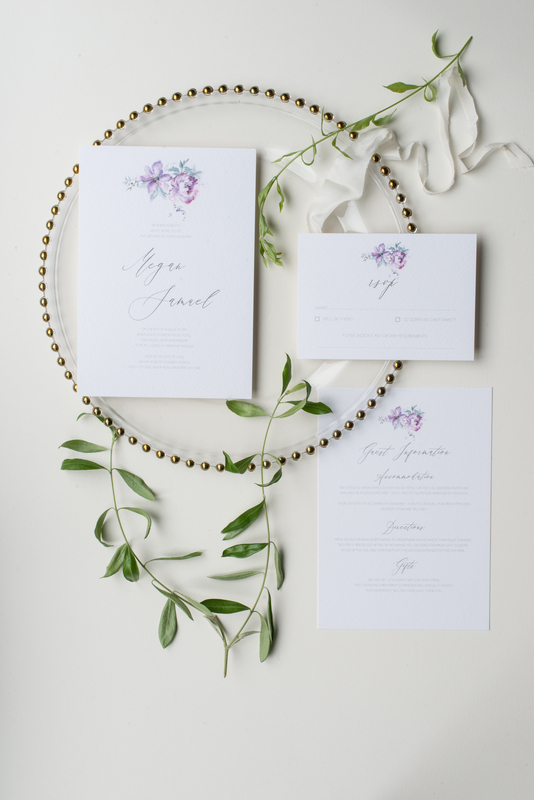 Rosehips are our favourite: their arrival in late summer brings joy and the memory of evening strolls, hand in hand… and this romantic asymmetrical wreath illustration by Amy Swann captures their beauty in a unique wedding invitation design. 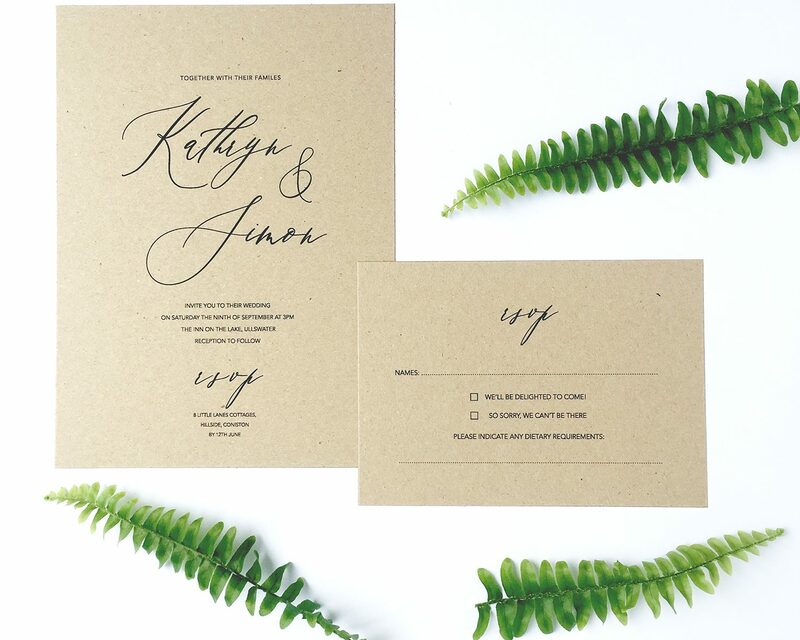 This is a sweet and simple wedding invitation, with Amy’s trademark attention to delicate detailing in illustration and organic calligraphy inspired by nature’s golden days. 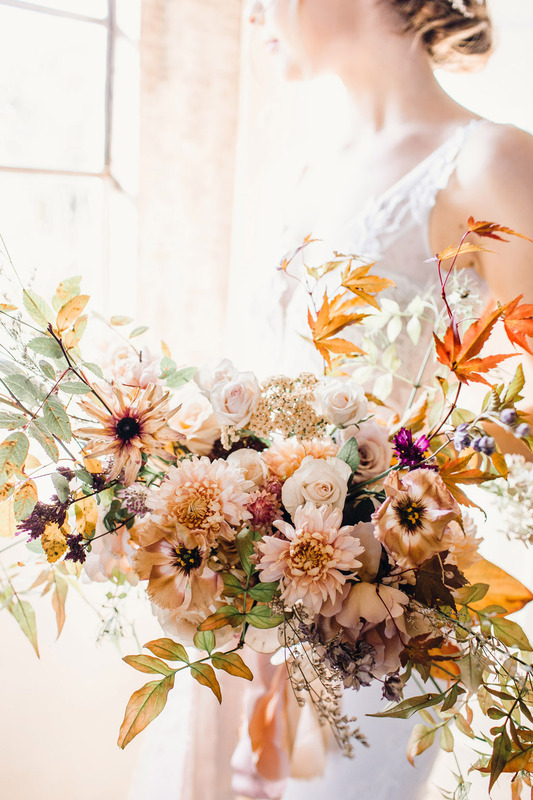 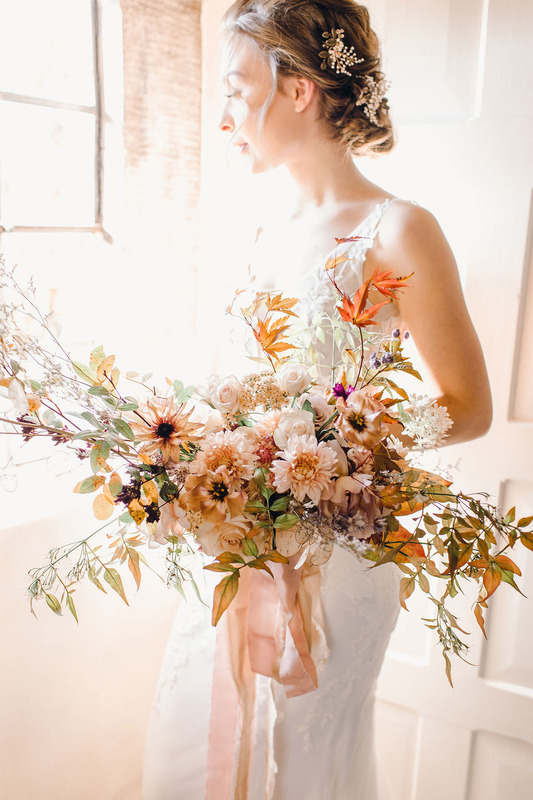 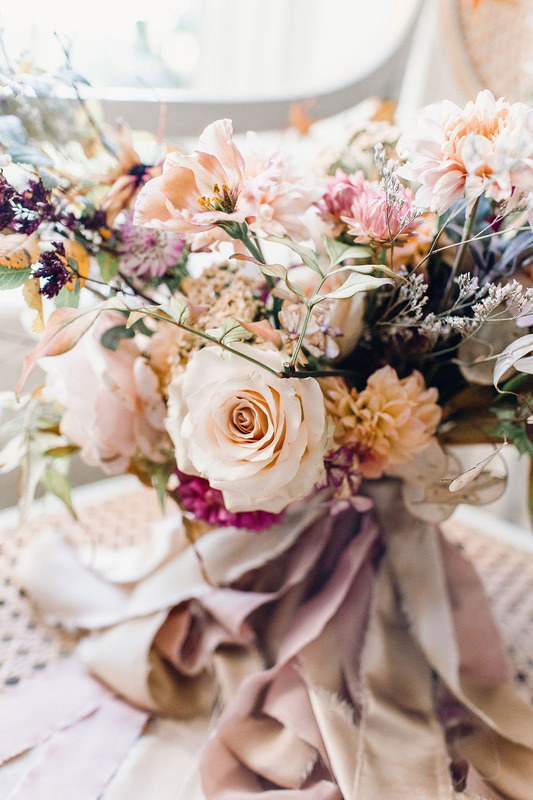 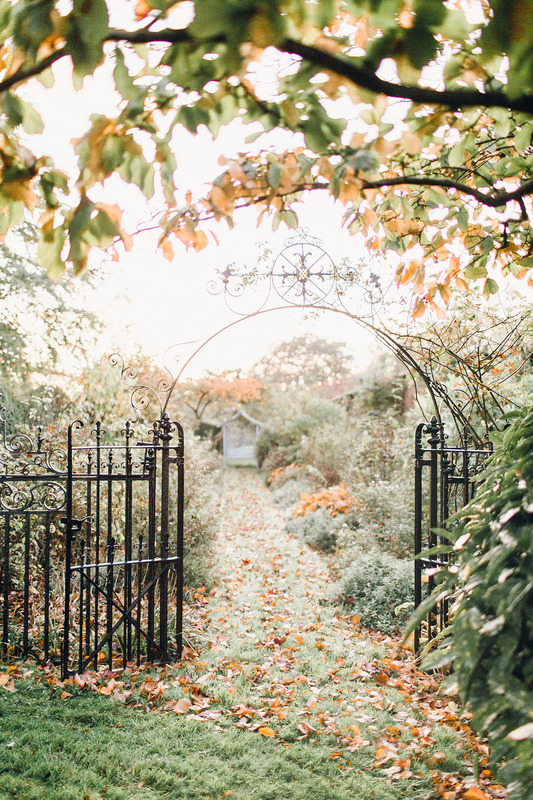 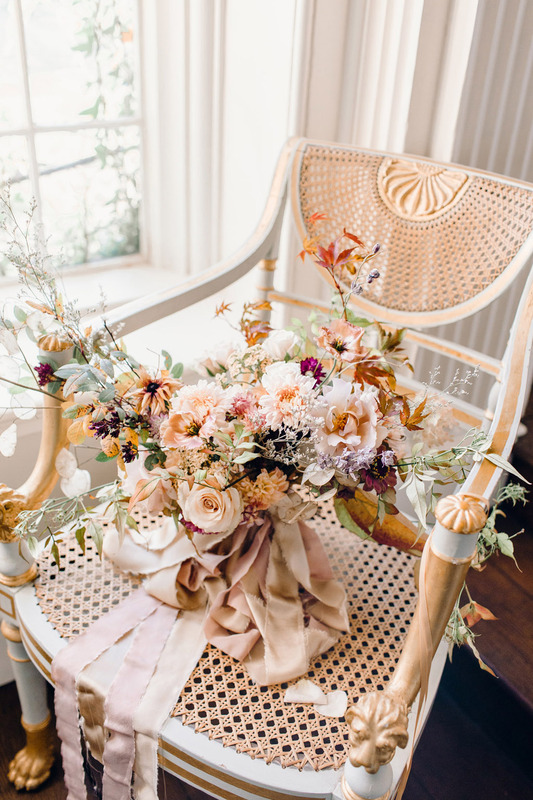 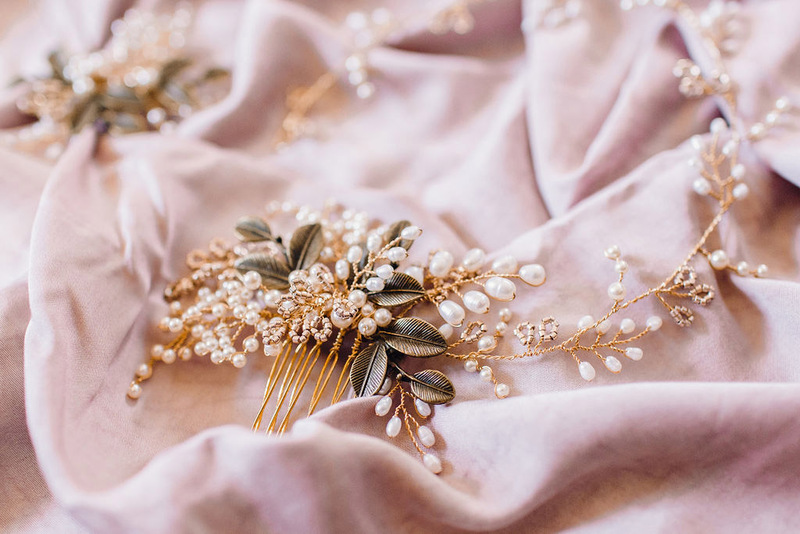 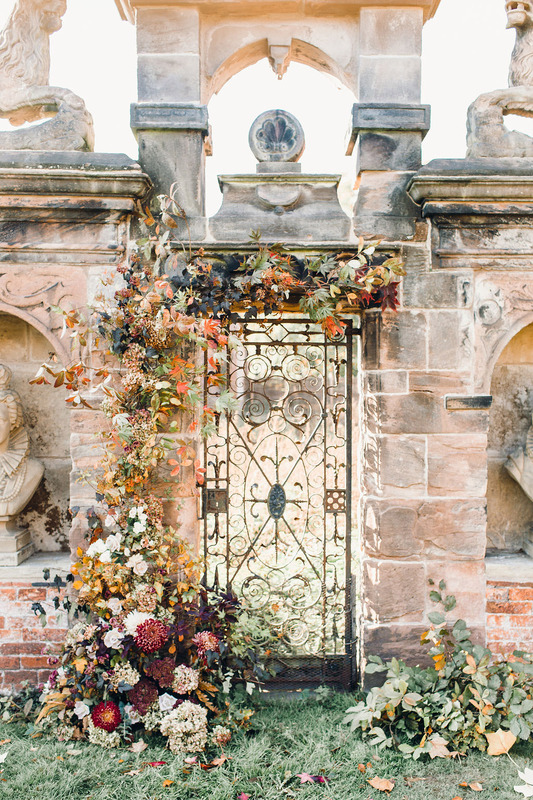 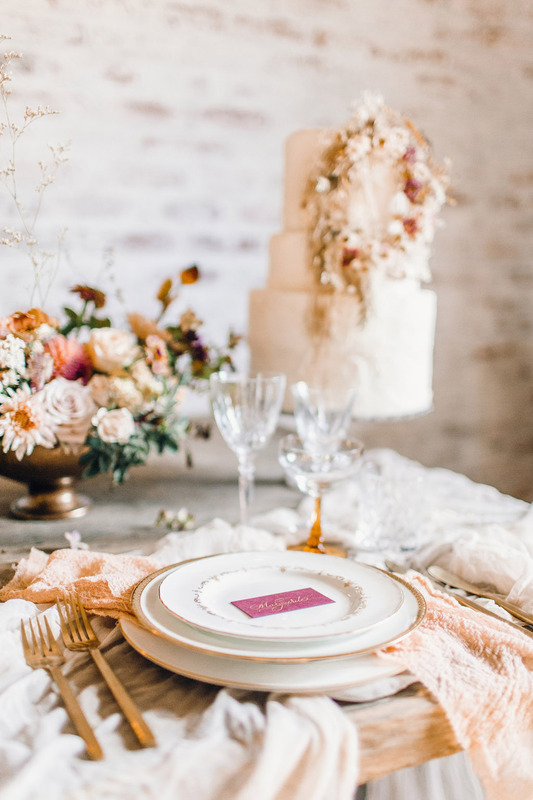 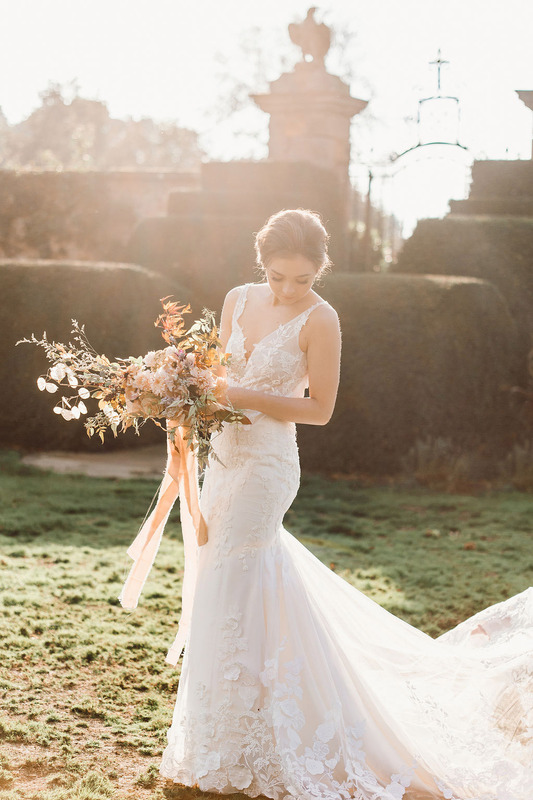 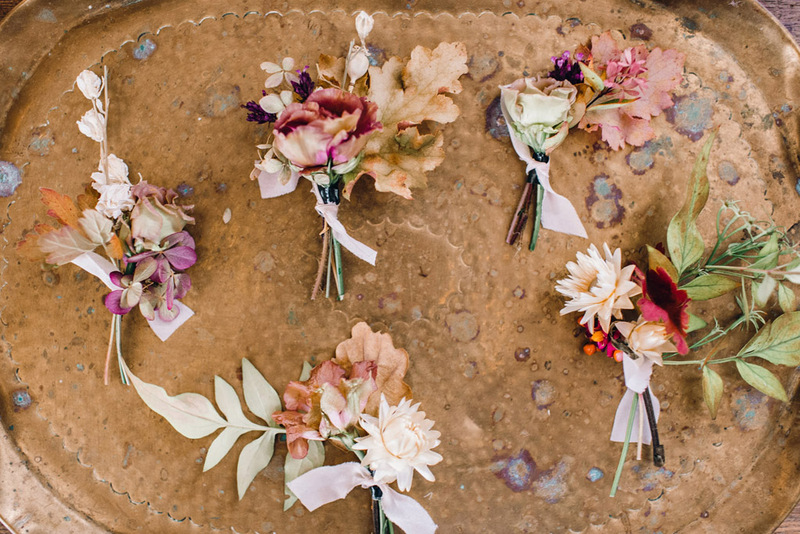 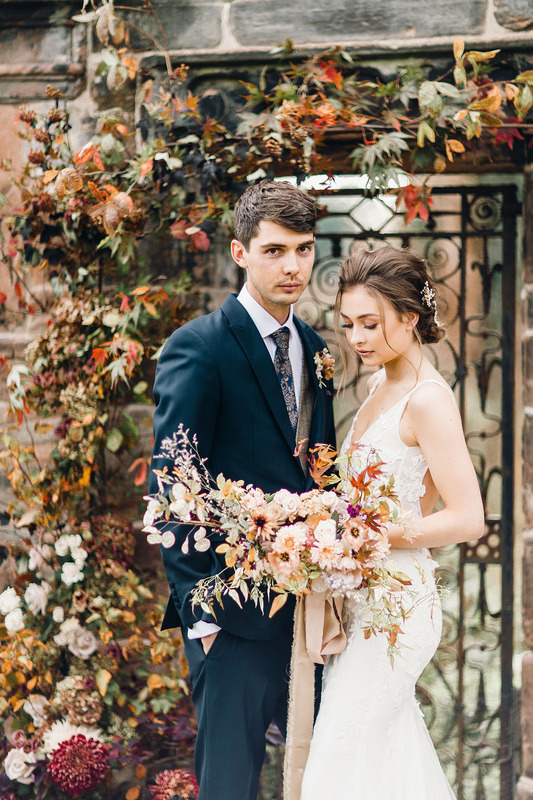 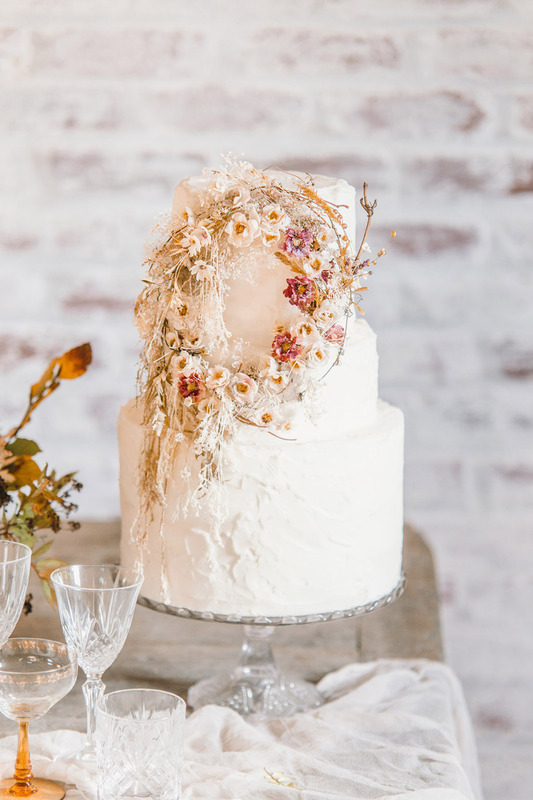 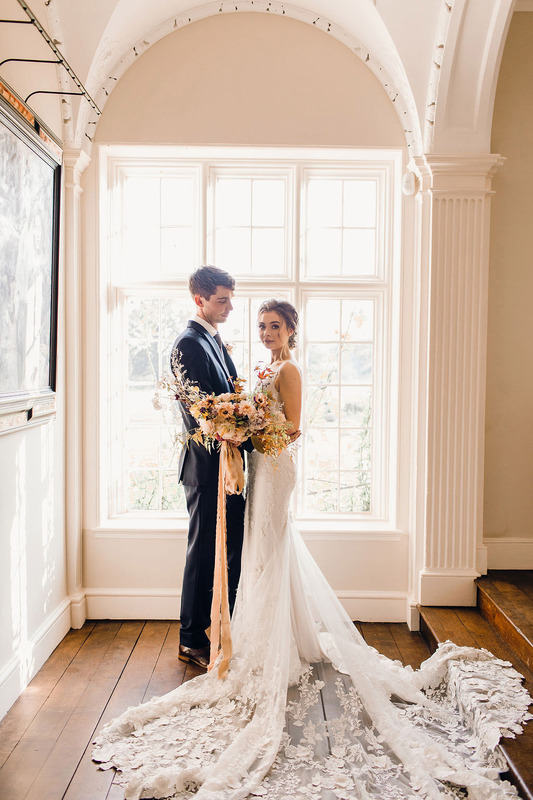 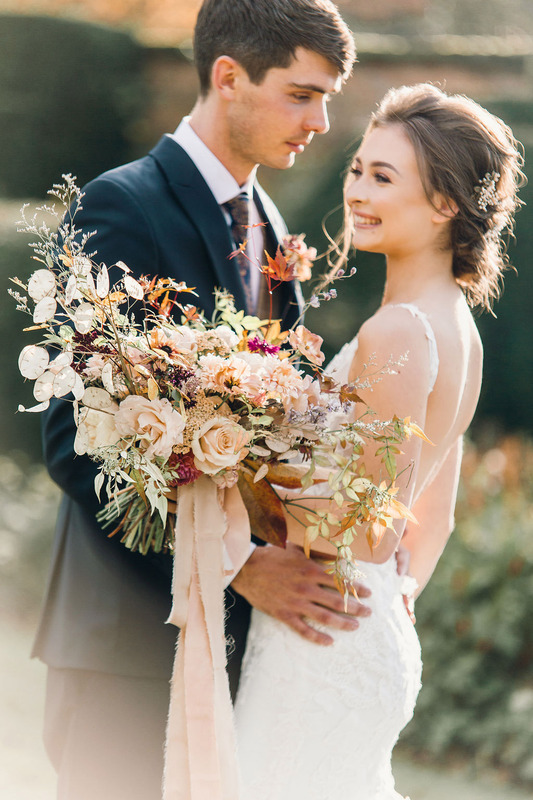 We love the soft hues and sweetly autumnal palette and we hope you will too! 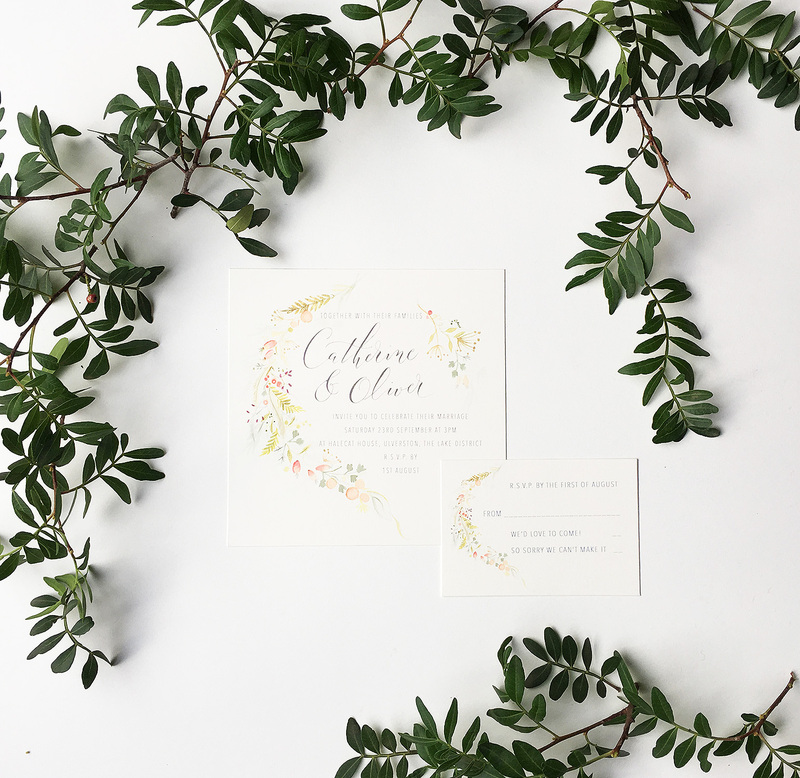 The beautiful Rosehips wedding invitation is available in my online shop from today, and prices start from £2.50 per invitation.